To view the full PDF of this report click here. Testing adhesion properties of a finish coating will ensure a successful performance from the product. To meet the ever increasing expectations of today’s discerning customer, highly complex finishes with multistep furniture style finishing systems are becoming more commonly used rather than the exception, across all sectors of the wood finishing industries. These trends in finishing require the use of glazes, shaders, toners and other high performance coatings. With these finishing systems, finishers must be more vigilant in testing to ensure the adhesion properties of the system used will successfully meet the expectations for performance of the product. Adhesion is a very broad topic with much attention placed on adhesion properties of the coating in formulators’ laboratories; however, from an applicators viewpoint, adhesion is often overlooked or misunderstood. From a finisher’s perspective it is my intention to provide a working knowledge of coating adhesion and methods of testing coating adhesion integrity. There are two factors that affect the ability of the coating to adhere to the surface: mechanical adhesion and chemical adhesion. Mechanical adhesion occurs by the coating adhering to the sanding scratch profile of the surface and by flowing around the fiber of the substrate to mechanically secure the film to the surface. Deeper and larger sanding profiles will increase coating adhesion whereas shallower profiles and smoother surfaces impede the ability of the coating to sufficiently adhere. Chemical adhesion refers to the ability of the coating to adhere to the chemistry of the coating formulation. Various components of the coating chemistry affect adhesion. The coating must have sufficient wetting properties to penetrate into the pores of the surface and to wet around the fibers of the substrate. Solvent blends of the coating system allow the coating to burn into coating layers within the system. Resin properties of the coating vary and affect the ability to adhere. As a general rule in moving up the scale in coating technologies, from lacquers to conversion varnishes, to two-part urethanes to polyesters, the adhesive properties will be significantly increased. It must not be assumed, however, that all products within each category will be equal in performance. Every product will exhibit its own specific degree of adhesion characteristics. The finisher is ultimately responsible to verify that the selected coating system will meet the necessary adhesion requirements for each specific finishing project. The same coating system will also exhibit different levels of chemical adhesion over various wood species and substrates. Wood resins and pitch and oils in the wood will significantly impact the chemical adhesion ability of the coating. Keeping in mind all the different factors that affect the performance of adhesion, the finisher must make sound decisions on the coating system to be used. A detailed finishing schedule and standard operating procedure should then be written and approved with a signature from the coatings supplier representative. To verify that the selected coating system is sound and secure, the finisher must always perform adequate testing of the film for adhesion prior to production. There are three different procedures to assess the resistance of the coating to separate from the substrate and provide different adhesion analysis of the film: cross-hatch test, scrape adhesion test and a pull-off test. The scrape test method utilizes a weighted, balance beam with a rounded stylus or loop attached to the beam. The panels with the dry finish film are pushed underneath the stylus and the beam is loaded with increasing amounts of weight until the finish is scraped loose from the substrate. The evaluator uses the weight in kilograms necessary to remove the film, to assign a value to the adhesive properties of the coating. This procedure follows American standard test method (ASTM) — D2197, D2248, D2454, 5178, depending on the coating and substrate to be tested. Complete test methods may be found on the ASTM website, www.astm.org. The second and most commonly used test method in the wood industry is the cross-hatch cutter test. This test is fast and simple to perform with an inexpensive cross-hatch cutter test kit. A lattice pattern is cut into the finish film down to the substrate, using a cross-hatch cutter. The test area is then brushed diagonally five times in each direction to remove any loose film finish particles. A special tape for testing adhesion is then firmly applied over the cross-hatch test area and removed quickly by pulling the tape back off of the test area to reveal the amount of coating lifted off by the test tape. 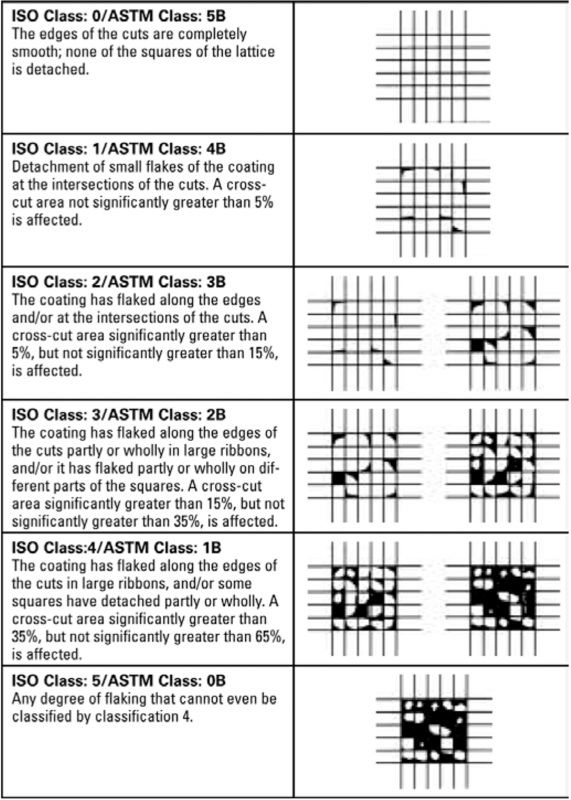 The cross-hatched test area is then visually compared to (ASTM) standards D3002 and D3359. ‍Pictured above, left to right, is the cross-hatch cutter test. First, cut a cross-hatch in finish film on a substrate with a crosshatch cutter. Then brush the cross-hatch area. With cross-hatch tape applied to the area, pull off. Finally, compare the cross-hatch test area with the ASTM adhesion standards, below right. Photos courtesy of AWFI. In the standards there are five charts with visual diagrams of varying degrees of film pull-off. ASTM class 5B illustrates no film pull-off representing the highest level of adhesion. ASTM class 1B illustrates between 35 percent and 65 percent of the film removed representing the poorest adhesion. Class 2B-4B represents varying degrees of adhesion falling between class 1B and 5B. By nature of this visual comparison the results are sometimes, somewhat subjective and not definitive with a numerical value associated with this test. The third method utilizes a hydraulic pull-off tester to measure the tensile stress in pounds per square inch (psi) required to detach the coating in a direction perpendicular to the substrate. To perform this test we used a DeFelsko Positest Adhesion Tester, following ASTM D4541 to perform this test. A metal loading dolly is secured perpendicular to the surface of the dry coating film by means of a CA (cyanoacrylate or “super glue”) adhesive or the adhesive supplied by the manufacture. When the adhesive is cured, the dolly is attached to the hydraulic pull-off equipment with hydraulic pressure applied and gradually increased until the dolly pulls the coating off of the substrate. A gauge on the tester shows the amount of pressure (psi) required to detach the coating from the substrate. The result is a definitive number that may be assigned to the adhesive property of the coating. 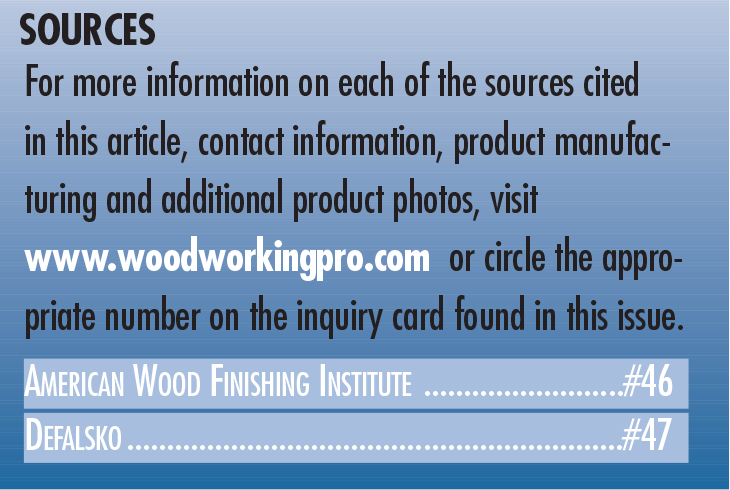 There may be differing readings obtained on different areas of the test panel due to varying wood substrate densities. The high and low range of pull-off pressure that is acceptable to meet expectations should be assigned to the adhesive value of the coating. According to our research, there is no standard found for expected pull-off pressure for each category of coating applied to various substrates and must be determined by the finisher for the specific coating system that is being evaluated. How much curing time elapse should occur, prior to testing for adhesion? It is recommended that the coating be checked after initial curing and after long-term curing occurs. 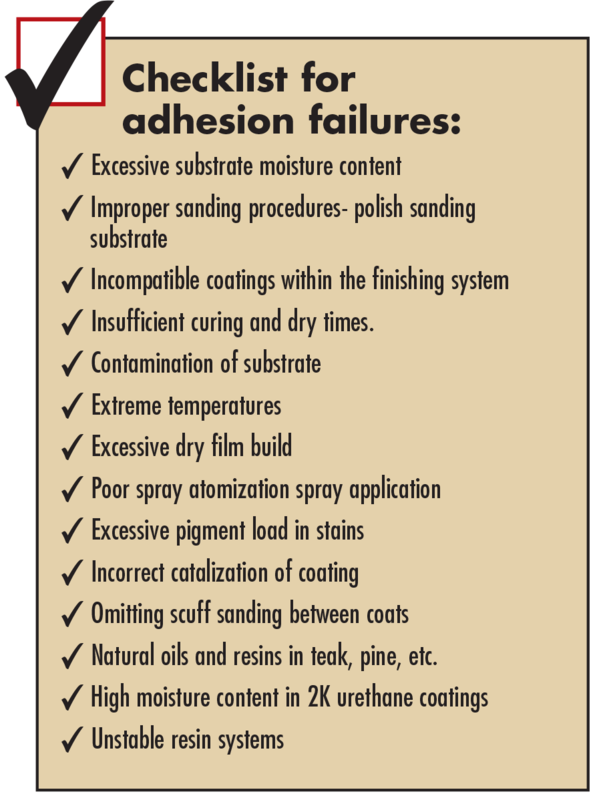 The coating manufacturer’s recommendations should be followed in regard to when to perform adhesion testing. Factors such as number of mils applied, ambient air drying or forced cured drying method and type of coating need to be considered as to when testing should be performed. Normally, after 30 days a second test should be performed. As coatings continue to cure, the adhesive properties will change. Some coatings will improve in adhesion as the coating continues to cross-link, other coating systems decrease in adhesion due to different rates of shrinkage between substrate or coating layers within the system. Finishers must never let down the guard against substandard adhesion. One major product failure may result in bankruptcy and cost you, the finisher, your job.